The town of Chappell was named for a railroad construction engineer, Charles Henry Chappell, who, as the story is told, had supplies sent to him and his crew along the line with the command, \"Send this shipment out to Chappell.\" The locality became known as \"Chappell\" from the time when there was only a box car on a siding and a crude cabin or two. The town of Chappell was platted in 1884 and registered September 19th of that year by J.B. Carmichael. Then began the land office business of selling lots with prices ranging from $4 to $20. 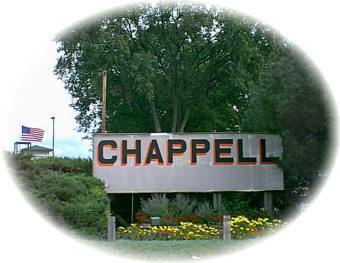 Chappell was incorporated as a village, the first in Deuel County, September 10, 1907, twenty-three years after it was platted and registered. There have been the usual small town businesses over the past 103 years including three banks, one being the Deuel County State Bank that was established in 1919 and the only remaining bank in 1987. Chappell has continuously had a weekly newspaper, \"The Chappell Register,\" since 1887. Chappell\'s widow, in 1936, gave the $15,000 library/art gallery to the town dedicated to the memory of her husband. Chappell\'s six churches have had a significant influence on the community. The town has a medical clinic, ambulance service manned by volunteers, volunteer fire department with a new fire hall, swimming pool, and other summer recreational activities. These include a lake for fishing, an airport with a 4000 foot asphalt runway, grass greens golf course, K-12 school system in two buildings, and a fine public library. Chappell takes pride in having several well known citizens in the community. Among them are Virginia Smith, Third District representative to the U.S. Congress: Ramey C. Whitney, former Nebraska state senator: Aaron Gunn Pyle, deceased, well known artist and student of Thomas Hart Benton; Merlyn Carlson, past president of both the Nebraska Stockgrowers Association and National Cattlemen\'s Association; Mrs. Hjalmer (Gertrude) Carlson, deceased, president of the Ash Hollow Centennial Association. This group presented \"The Ash Hollow Pageant\", an event that included a cast of some 900 people from several counties in the area, acclaimed as one of the finest celebrations in the state during the Nebraska Centennial. Chappell's municipal golf club lies alongside the Chappell Lake located just north of the I-80 Chappell exit. The nine-hole, grass green course is a beautiful and challenging course open to the public from daylight to dark. Set your hook in a largemouth bass, catfish, perch, walleye, or bluegill in this 30 acre community lake. A year-round flock of Canada geese have also made the lake their home.